All transactions are safe and secure with a reliable history in online purchasing behind each of our associates. 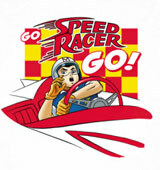 Buy the Go Speed Racer Go! shirt to own Speed Racer clothing and merchandise. Put the pedal to the metal in this white Speed Racer shirt that displays a picture of Speed driving in the Mach 5. The familiar "Go Speed Racer go!" quote appears above Speed and his car. A red and yellow checkered flag can be seen in the background of the tee, indicating that he is putting the pedal to the metal to win the race. Wear this tee to capture the attention of the Trixie in your life. In addition to the Go Speed Racer Go! tee above, browse the Speed Racer Clothing Gallery for more apparel like men's and women's clothes, kids shirts or hoodies.